Thank You Notes for Birthday Gifts: Be nice and say thank you to everyone who bought you a gift on your birthday. It is probably one of the easiest ways to assure a gift next year too. Whether it is your parents, friends, partners, work colleagues or boss – tell them how much you liked their gift. They will be encouraged to buy you an even better gift for you on your next birthday. 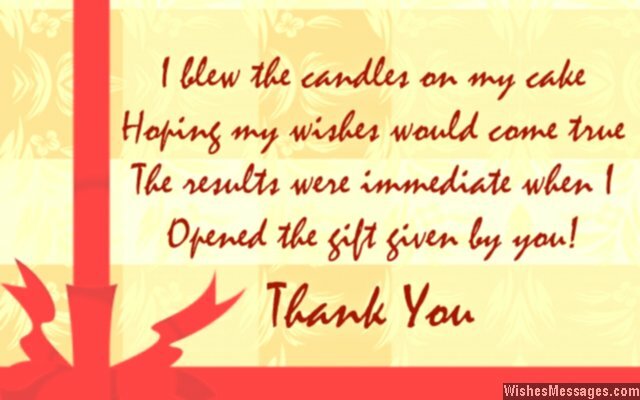 You don’t need to go all out and buy a greeting card to convey your gratitude. A sweet tweet, funny Facebook post or even a cute message on Snapchat should be enough when it comes to birthday gifts. 1) Your gift is something that made me smile and cry. Its joy, words can’t express and money can’t buy. Thank you. 2) Your gift and I are made for each other and a match made in heaven. Thanks for playing cupid and introducing me to the gift that I always wanted. 3) The choosy person that I am, buying a gift for me is a difficult mission. But the only way to describe your gift to me, is that it is sheer perfection. Thank you. 4) In the art of gifting, we are the perfect pair. You are the greatest artist and I am your talent’s biggest connoisseur. Thanks. 5) A gift speaks volumes of a person’s personality, generosity and creativity. Your gift suggests that you have a cool personality, you are way too generous and you are creative at heart. Thank you. 6) I know why you gave me a WATCH – you want me to think about you all the TIME. Thank you. 7) You, my biggest weakness gifted me my second biggest weakness, chocolates. Thanks, I love you. 8) Thanks for the lovely flowers you gave me on my birthday. They made my birthday colorful, fragrant and beautiful. 9) Gifting is an art, and I must say that you are the coolest artist around. Thanks. 10) You did the right thing by removing the price tag on the gift that you gave me because it is truly priceless. Thanks. 11) Boxed gifts are passé, gift cards are in. Thanks for keeping up with the times. 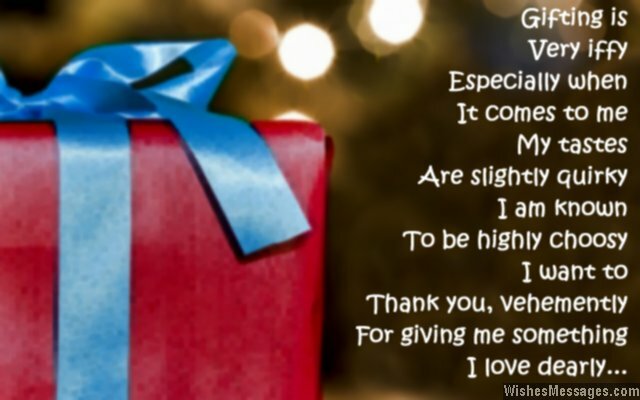 12) This is not just any other thank you note, this is a congratulatory note because you have just been awarded the title of the King of Gifting – and I am pleased to be the recipient of your abilities. Thanks. 13) My birthday went from being an OCCASSION to a CELEBRATION after I opened your gift. Thanks. 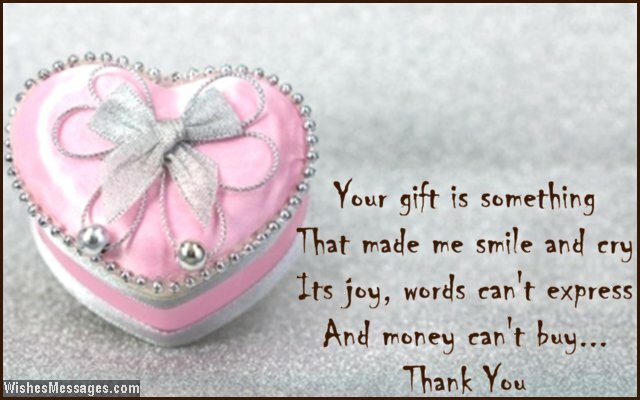 14) Your gift is obviously royal in terms of value and price, but it is priceless in terms how it made me feel so nice. Thank you. 15) Opening your gift was the perfect way to start a new year in my life. Thank you. 16) Gifting is very iffy, especially when it comes to me. My tastes are slightly quirky, I am known to be highly choosy. I want to thank you vehemently, for giving me something I love dearly. Thanks. 17) Thanks for the gag gift you gave me on my birthday. I promise that next year, I will be the one having the last laugh. 18) I know I am late and that this message was long overdue, but I have been busy enjoying the gift given by you. Thank you. 19) You really didn’t need to put so much effort and money in giving me something special for my birthday. Your loving presence in my life is my biggest gift. Thanks a lot. 20) Your gift is so beautiful, maybe some of your beauty rubbed off on it. Thanks. 21) I think you are a magician or a psychic in disguise, because your gift was my birthday’s best prize. Thank you. 22) After looking at the gift you got for me, I have suddenly realized how much I love you. Thank you. 23) It’s one thing to have deep pockets but it is a different thing to have a deep heart – you’ve got both. Thanks for such a thoughtful and expensive gift. 24) How good a friend you are, is directly proportional to how good a gift you give me. Going by that, you are my best friend. Thanks for such a lovely gift. 25) Many people are blessed with the buying power of money but very few people like you are blessed with the buying power of aesthetics. Thank you for such a lovely gift. 26) The gift you got for me is perfect in every way – it perfectly suits my needs and it perfectly reflects the classy person that you are. Thank you. 27) Thanks for picking up on all the hints I’ve been dropping on Facebook. You got me exactly what I wanted for my birthday. 28) Your gift is not just a mere gadget. It is something that will give me access to an ocean of knowledge and wisdom. Thanks. 29) The gift you gave me for your birthday is just like you – luxurious, unique, creative and extraordinary. Thanks so much. 30) I hope that I will be able to write success all over my life with the expensive pen that you have given to me as a keepsake present. Thank you so much. 31) I blew the candles on my cake, hoping my wishes would come true. The results were immediate when I opened the gift given by you. Thanks. 32) Thanks for the lovely digital photo frame you gave me as my birthday gift. No prizes for guessing whose picture I am going to put in there – YOU. 33) Thanks for adding to my blessings by writing a check and donating to my favorite charity. You have not only changed the life of someone needy, but mine too. 34) I always knew that you were the coolest among all my friends. Your gift proves it. Thanks. 35) I know that the value of a gift should never be measured by its price tag. But I have to admit that a hefty price tag sure does add charisma and charm to a gift which is exactly what I would want – and yours is exactly what I am talking about. Thanks. 36) Your gifts are known to stand out as the best among everyone else’s. I’m glad I have you as my friend. Thanks. 37) I always knew that you had a rich taste but I never knew that your pockets were rich too. Thanks for your gift. 38) Birthdays will keep coming and going, but the memory of such a thoughtful gift will linger in my heart forever. Thanks. 39) You gave me two gifts on my birthday. One, is the wrapped box and the second, is the smile that I have been carrying around on my face ever since I opened that box. Thanks so much. 40) Your gift is a classic example of how it doesn’t take a price tag to spot something that is lavish, extravagant and delightfully luxurious. Thanks.